EEC's Phonocardiograph provides high-fidelity recording of heart sounds, respiratory sounds and murmurs. It has a low noise and distortion- free amplifier with a built-in speaker for audio monitoring. Phono-pre-amplifier: Matched to sensor with gain adjustable upto 5000. Filter: Mass-Weber type with cut-offs at 1 Khz with slopes of 20 db, 30db, 40db and 60db per octave. Adjustable by 5-Way rotary switch. Ouput Level: Audio-visual indication with light flashes and beeps. Output electrical signal available : 2 Volts peak to peak. Output impedance : Less than 100 ohms. Power Requirements : 220 or 110 volts/50 cycles, or external 12 volts D.C.
Power Consumption: Less than 2 watts. Size/Weight: 42x30x12 Cms /3 Kgs. All copy rights reserved. E &.O. 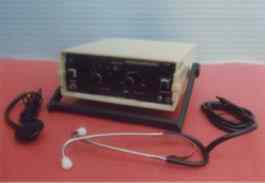 E.
electronic stethoscope,systolic murmur,murmurs, heart sounds,P.C.G.